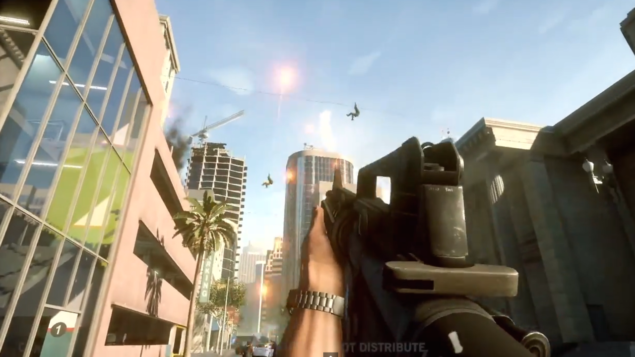 The Battlefield Hardline beta was released this past Tuesday without much fanfare to the wide and wondering world, and it certainly has made an impact on fans of the series. That impact is both positive and negative depending on your stance on the change in direction. It’s important to remember, however, that this is a beta test, despite being an open beta test. Just because one can play the game doesn’t mean that it’s completely finished, and one cannot truly judge the quality of the finished game based on this beta. Visceral Games are using a player feedback system to try to fix glaring and even subtle issues before it’s released. The senior producer for the game, Scott Probst sees this as an opportunity to truly polish the game, as the players are indeed key to the success to any game. We’ve, in not so many words, been promised more infantry and ground focused gameplay, and by Jeff, I think we’ve got it. It’s not perfect by any means, and it isn’t finished either. That and obviously there will be those that vehemently dismiss the game because it’s another installment in Battlefield. But such is life. Nothing can satisfy some people I suppose. Battlefield Hardline beta is slightly surpassing expectations with over 5 Million players of the beta. The feedback they can potentially provide has a chance to create a game that Battlefield 4 should have been when it was first released. I get it, I really do. It shares a lot of the same elements of its predecessors and looks suspiciously familiar. The comments are usually rife with accusations that this is nothing more than a DLC for Battlefield 4. But did people make the same accusation about Battlefield 4 being nothing more than a DLC of Battlefield 3? Aren’t they even more similar in both gameplay and objectives than Hardline and 4? Perhaps the beta does seem like it’s a bit limited in its scope, but it’s a beta. That and it does introduce objectives that I don’t think have been tried in this type of game before. Sure, the 64 player conquest is there, and it’s just as conquesty as ever. But there are new and novel ways to play, or at least new and novel ways in which to approach tired gameplay elements. So if you can separate the game and enjoy it based on its own merits, it might surprise you and you might even enjoy it. The pace of gameplay is much faster than the average Battlefield game of the past, something that I think numerous fans have been wanting for some time. The maps themselves seem to be large enough with adequate numbers of independent hot spots where the action takes place. Indeed, the ground is where the action is now with vehicles in this beta playing second fiddle to the actual action. No more tanks or jets to ruin your day. The vehicles are either not armored or lightly armored making them easy targets for even the novice no-scoping sniper. Shooting through the windshields like in some Hollywood action movie to attempt to incapacitate the driver as they speed towards you is quite the thrill. I even actually hit the driver once too! There are three different game modes that one can peruse in this beta, that of a Bank Heist mode, similar to the earlier beta that was available to closed audiences, Hotwire mode, and a more familiar Conquest mode. Two very unique modes and one very, oh so incredibly familiar and fun mode. First let’s discuss the conquest mode as it’s something we can all relate to. The map they let us play on, Dust Bowl, seemingly represents a small southern California locale that may be known for drug problems. Drugs, however, do not play a role in this map under this particular game mode. That isn’t to say that the final release won’t see some sort of drug trafficking game device. It’s a very immersive map with many different elevations, scattered buildings, an underground tunnel system and even a random sand storm that decreases visibility by a few orders of a magnitude and adds a bit of visual flair. The motion blur and Gaussian effect really adds to that aforementioned immersion, and it doesn’t even last that long, unlike the wonderful Battlefield 4 map, Gulf of Oman where it seems to drag on until the map is over. I found myself thoroughly enjoying this mode of gameplay, and the map was well suited to this kind of mayhem. It was just the right size with just the right amount of conquest points. Bank Heist, or Blood Money, follows the same principles that we saw in the previous closed beta, and even takes place in the same map, Downtown. The goal is to steal as much money as possible from the bank location while fighting off the opposing force. You can still enjoy camping at the opposing teams drop off point to steal their hard earned cash, which is always a riot when no one is back there to cover that particular activity. It’s a fantastic piece of gameplay that has a lot of potential. One map hardly does the concept justice. The adrenaline rushes as you sit at the bank trying to gather as much money as you can, all the while wondering where the snipers are going to inevitably shoot you. It’s fun. Taken as it is and not compared to other games or gameplay modes, it’s actually quite fun. Remember, this is a beta. Hotwire is a very intriguing part of the game. It’s a car chase. A very fun car chase. As the criminals you’re tasked with stealing cars at certain points throughout the map, both Dust Bowl and Downtown. Once stolen, you have to drive around in possession of them for as long as possible all the while being chased by the police who attempt also vie to control the very cars you are looking for, or destroy you, in a very high-stakes and very violent car chase. It’s rather exhilarating actually, and not at all what you would expect. Certainly don’t compare this to the GTA series, Payday or any other similar game. The driving mechanics are clunky and the overall gameplay relies on that infantry tactic aspect, but it doesn’t detract from enjoying it. This beta highlights some of the more wonderful things of this upcoming game. It shows us that it does indeed have the potential to wow us, if even somewhat slightly. Hotwire shows the benefits of teamwork and of using interesting ways to capture and destroy cars. The more people you have to help defend you the better. Sure the helicopter seems to give an unfair advantage, as you can’t really outrun or hide from it without crashing horrible due to the clunky steering, but it’s still entertaining. Bank Heist may be at its core a classic “go here grab this” formula, but it adds excitement and danger that only a first person shooter can provide. It’s also fun to try to steal the other teams money while they’re unawares, though that opportunity was always rare for me while playing. But I digress. Sometimes I have to remind myself that the point of games is not to critique them and belittle them, but instead to enjoy them. We play video games to have fun. This beta is fun. All the game modes no matter the balance issues or problems with the mechanics can be enjoyable. Even though we make choices and think through some games, we should remember to enjoy them. Battlefield: Hardline has the potential to be one of those, and could very well revive the series after what seems like a long hiatus. Battlefield is back. And it’s Fun. There’s a really simple answer to those that seem to be overly biased against or just outright hate the Battlefield series: Just don’t play them. If you hate them that much or berate EA for releasing a souped up DLC, then just don’t play it. It’s that simple. Go play something else you do enjoy instead of wasting time and energy bashing something you hate. Or even better, go make your own game with the clearly vast knowledge of what makes a perfect game. No one is holding you hostage to play this or any other game. Go play what you love! And if you happen to love Battlefield, then the Hardline beta is still available through Monday, February 9th 2015.